AVL Track's mission is to offer his customers a reliable, easy to use yet very efficient business solution. Our developers and engineers have worked non-stop for the last two years to come up with this new generation of GPS technology. AVL Track is a Montreal born company, built on solid foundations. It is the result of 20 years of experience. The shareholders of Radio Service LCT Inc. have developed a precious expertise and a solid financial base. This is why we decided to develop the AVL Track tracking system based on the cellular phones. In only 5 years, we went from a bold idea, to the making it happen and offering it today to more than 6000 users! Being the innovators and creators of this new technology, be assured that we will fulfill your needs in terms of GPS Tracking, for many years down the road. Our team at the major exhibition CTIA Wireless in LasVegas. 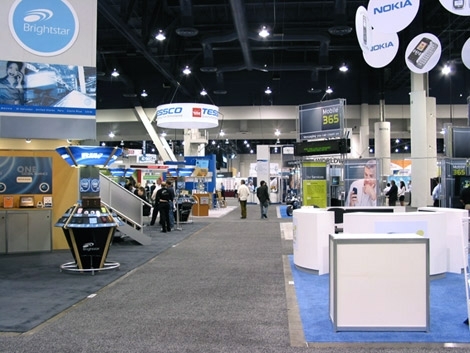 An idea of the scale of the CTIA Wireless exhibition. Collaboration with Motorola Canada at the Palais des Congrès in Montreal.